Watch as Davison’s Better Way to Invent turns Ed’s Better Tether idea into a store-ready reality! Ed Yoder loves his canine companion, but doesn’t love leaving his pet tethered outdoors without a sufficient food and water supply. Conventional tethering devices often tipped his pet’s dishes and needed to be moved for the lawnmower. Ed knew there had to be a better way! 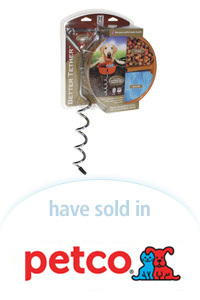 After coming to us for help in designing his product, it was licensed by a company looking for innovative pet products.